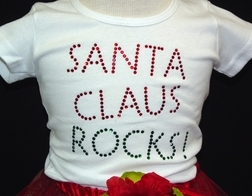 Attitude Pie features Christmas bling shirts with "Santa Claus Rocks!" The words are made with shiney crystal dots in green and red. The shirts are made in white with short sleeves. 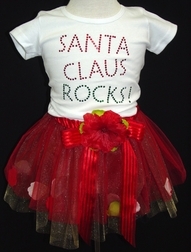 The shirt is paired with a matching red and green tulle elastic waist tutu with a bow and flower petals inside the red tulle by Beary Basics. This sweet little outfit is perfect for that perfect princess as a fru fru play outfit for Christmas day and all through the season.